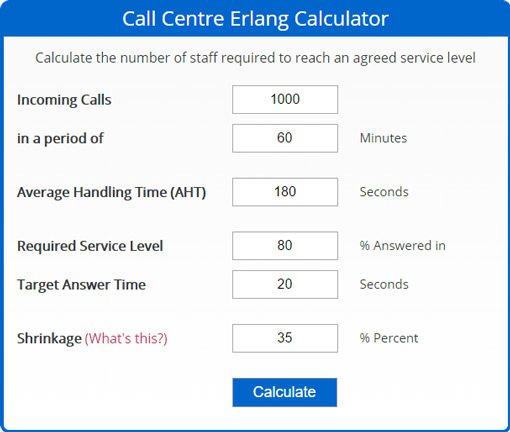 An Erlang calculator is one of the most useful tools in the call centre toolkit. An Erlang Calculator is a mathematical calculation that allows you to calculate the number of staff that you need for a given number of calls, to meet a given service level. It is based on the Erlang C formula (a derivative of the Poisson distribution) that was designed by the Danish Mathematician A.K. Erlang around 100 years ago. The formula is quite involved, but is relatively easy to follow if you studied maths to a reasonable level at school. 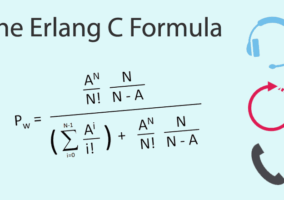 See this article for a worked example of the Erlang C formula. You simply enter in the number of phone calls that you receive in a period of time (say per half hour), along with the average duration of the calls and also the service level that you are looking for. Some Erlang calculators also include a shrinkage input. There are two main formats for Erlang calculators. This Excel-based worksheet uses macros, automated input sequences or add-ins, to perform the calculations due to the complexity of the mathematics. Whilst there are some examples where people have been able to perform the function without using macros (using the Poisson function), these tend to need multiple rows or columns to obtain the required results. For more information on the Poisson Distribution, read our article: How Is Average Handling Time Distributed? It is not how you think! Easy to build a mini workforce management system. Flexible – easy to perform what-if type functions and compare whole days or weeks of calls. Requires macros to be enabled. Many do not take account of shrinkage. Typically only work up to around 200 agents (700 agents tends to be the absolute limit for double precision floating point numbers). This formula is more accurate as it includes shrinkage (holidays, training, meetings, etc.) and therefore gives a more realistic staffing requirement. A new generation of Erlang calculators has emerged that are available online. These are freely available online and are easy to test. Great for what-if type calculations. Some can perform calculations in excess of 700 agents. Do not require any software download or potentially harmful macros to be installed on your PC. Most calculators do not take account of shrinkage. Errors over 700 agents. Many online Erlang calculators produce wrong results for large number of agents (see below for how to check this). 14,200 calls per hour, 180-second call duration, 80% of calls handled in 20 seconds (with no shrinkage if the calculator provides it). The correct answer should be 721 agents. Many calculators will confidently predict 711 advisors (often with a Service Level Prediction of nan [not a number]). So, enter: 14,100 calls per hour, 180-second call duration, 80% of calls handled in 20 seconds (with no shrinkage if the calculator provides it). Every calculator will then give the right answer of 716 advisors. This tells you that despite putting in a lower call volume, and keeping all of the other variables the same, the number of advisors has actually increased from 711 to 716, so something must be wrong. Find some other examples that will enable you to check your Erlang Calculator below. Does the Erlang Calculator “Amount of Calls” refer to Inbound and Outbound calls. 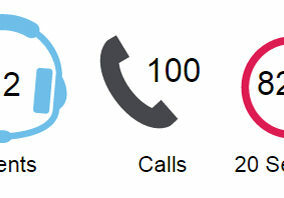 Would you consider doing to seperate calculations on Inbound and Outbound calls? The Erlang calculator only applies to inbound calls as these are the types of calls that have queuing applied to them. Best results if you use this tool if you calculate per interval. Please correct my statement if this is incorrect. i tried to compare the calculation of a day overview and per interval on a day overview. would the result differ base on the time period of the calls that will be coming in or is it because the calculator have a much deeper view on the calls per interval giving a higher staffing requirements than the results in the day view? Hi, is there available an erlang calculator tool that considers the period in months. 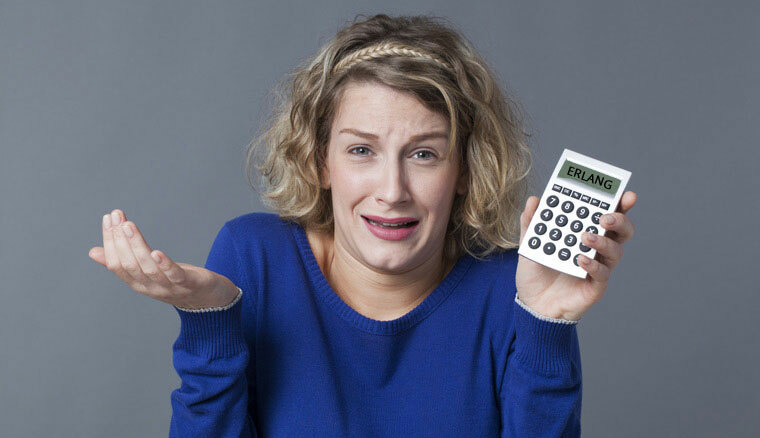 My necessity is to calculate how many agents I need per month.